In Defense of Eating Alone: Chorizo, Poblano & Sweet Potato Fajitas with Lime-Marinated Red Onions – Eat Me. Drink Me. For three euros, it was a massive affair. A fresh slab of pita stuffed full of lamb, red cabbage, cucumber, tomatoes, onions, crumbling cheese, and threaded through with cool, garlicky tzatziki sauce. I ate it on a rickety metal chair outside the shop and watched people walk by. I didn’t care that my hands were covered in drippings or that if I set that sandwich down I’d never be able to pick it up again – every bite tasted like growing up. I love eating alone especially when I have hours of uncommitted time and a complicated recipe. There is nothing nicer than really slicing a pepper into perfect juliennes while a ball of dough rises on the counter and a saucepan on the stove wafts the enticing aroma of onions and garlic turning translucent in butter. 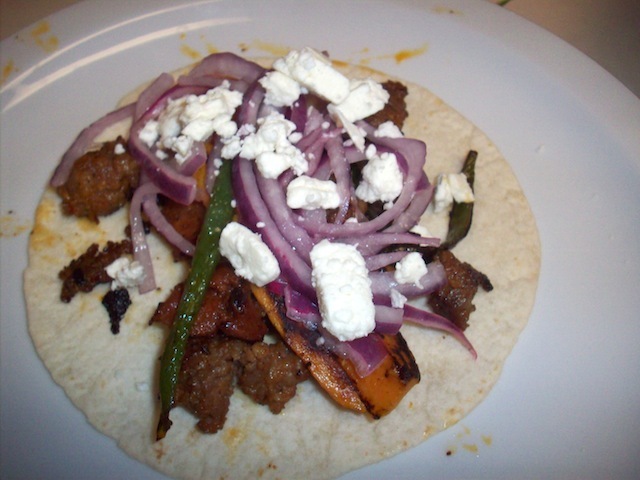 Just last week, I tried out a new recipe for fajitas filled with chorizo and hot Italian sausage, poblano peppers, sweet potatoes, lime-drenched red onions, and feta cheese. The preparation was simple–I had only to cut vegetables, sauté sausage, squeeze fresh lime over red onions, and throw everything together on a tortilla. But from those elemental foods emerged something sublime. Rich, hot, spicy sausage battling for supremacy with pungent feta and onions with a subtle train of smoke from the poblanos lingering after all the rest. I shoveled that meal into my mouth alone, standing by the sink, but I felt no affinity for that other meal, that lonely, hurried chicken breast. Eating with other people is good and cooking for other people is even better, but there are things you can do when you eat alone that you cannot do with other people. You can moan and eat. You can take bites that are far too large for your mouth to squeeze in every flavor and not care how long it takes to finish chewing. You can let melted butter or the spiced juice of sautéed sausage run down your arms without dropping your food for a napkin. You can leave streaks of chocolate on your face. For the joy of not having to think about anything but how good something tastes and knowing that I’m never really alone with good food in hand, I continue to defend the solitary bite. Adapted from Bon Appétit, January ’09. Toss onions, generous sprinkle of salt, and lime juice in medium bowl. Set aside to marinate, tossing occasionally. Place sweet potato and a splash of water in microwave-safe bowl. Cover; cook on high until tender, 5 minutes. Sauté chorizo and Italian sausage in large nonstick skillet over medium-high heat until cooked through, breaking into small pieces, about 5 minutes. Transfer to bowl. Add chiles to skillet. Cover and cook until tender, stirring occasionally, about 4 minutes. Drain sweet potato, transfer to skillet. Add sausage and toss 1 minute to re-warm filling. 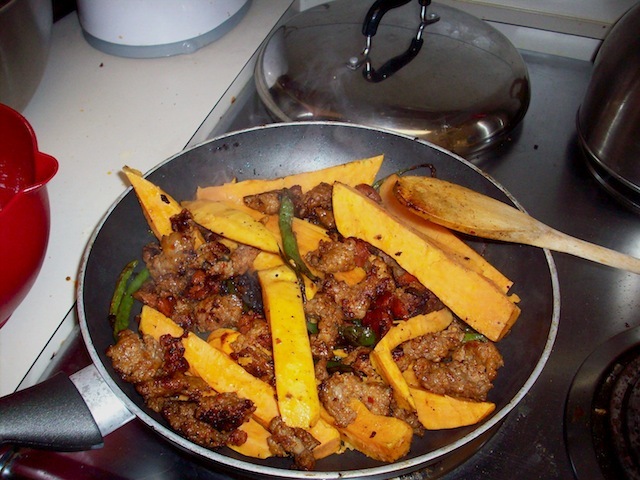 Fill tortillas with sausage and sweet potato mixture, cheese, and onions.